Today, it is clear that there is more to the universe than what meets the eye- a lot more. It is estimated that only 4% of the total mass in the universe is due to the "normal" matter that we see, and the rest of it appears to be made up of things we have not yet observed. While we can see the effects of dark matter and are sure most of it can be found in "halos" around galaxies, it does not emit enough electromagnetic radiation to be detected. This dark matter is estimated to be a full quarter of the missing mass, with the remaining 70% comprised of the more mysterious dark energy which is thought to permeate the universe. Explaining dark matter is one of the pressing questions facing astrophysics and particle physics today. 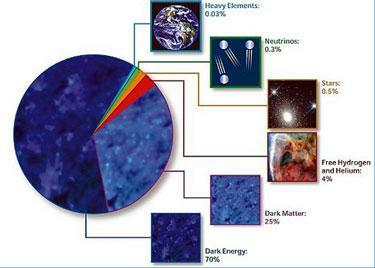 Over the years, there have been several proposals regarding the composition of dark matter. "We know dark matter will be some new substance we have not detected before," says Paolo Gondolo, a University of Utah physicist. His research focuses on trying to find evidence of dark matter by looking at astronomical objects and calculating what dark matter effects we could expect to see. Scientists know about dark matter because it exerts a gravitational pull on normal matter in the universe, as Zwicky discovered decades ago. Since then, our abilities to see deeper into the universe have increased. Effects from this extra mass can be seen by observing light on Earth that appears to be bent due to passing by a large object. Such an effect, predicted by Einstein's theory of general relativity, is known as a gravitational lens. By observing gravitational lenses from Earth, astrophysicists can calculate the distribution of dark matter particles in a particular area and how it affects the visible matter. But could you actually detect a dark matter particle if you tried? Physicist Dan Akerib of Case Western Reserve University thinks so. He is a member of a project known as CDMS (Cold Dark Matter Research) whose goal is to detect dark matter particles here on Earth. "We're particularly interested in WIMPS, which is short for Weakly Interacting Massive Particles," he explained in his Cleveland, Ohio office. According to theoretical calculations, WIMPs would only interact with other particles through gravity and the weak nuclear force that binds atomic nuclei (or a force of comparable magnitude), so their existence would be hard to detect. Despite this difficulty, Akerib feels certain about the existence of WIMPs: "WIMPs fit very well with the current Standard Model of particle physics," he said, referring to the theory which describes the particles and forces that make up all matter. Unlike many other proposed particles, which rely primarily on cosmological discoveries, Akerib notes, "there's an awfully good opportunity for nature to have a Standard Model that involves WIMPs by particle physics, not just cosmology." In order to detect WIMPs, the CDMS group has built a detector of cooled germanium and silicon crystals, which is located deep in the Soudan Mine in northern Minnesota. The atoms in the crystals experience ionization whenever they interact with a particle, and the team is able to analyze what kind of particle caused each interaction. So far the CDMS results have been negative. Despite this, however, Akerib remains optimistic: CDMS has set new sensitivity limits for several promising WIMP dark matter models, he says, "and we still have a lot to do!" Although there are several teams of astronomers and physicists on the lookout for dark matter, there is also a small but vocal minority of scientists who are not entirely convinced of its existence. "In order to explain the effects of dark matter there are two possibilities: more matter or modifying our understanding of gravity," says Glenn Starkman, a theoretical physicist from Case Western Reserve University. The most famous model for this is Modified Newtonian Dynamics (MOND), which corrects for Newton's laws at small accelerations and could potentially explain several perplexing observations. In recent months, however, MOND has come under scrutiny due to new astronomical discoveries. In August 2006, a team of astronomers imaged a pair of colliding galaxies- known as the Bullet cluster- in order to determine if dark matter was affecting what they saw. The team found effects that would be difficult to explain with a MOND theory, says University of Arizona astronomer Doug Clowe: "These results are direct proof that dark matter exists." Despite these new results in favor of dark matter existing as a type of particle, Starkman remains cautious. "MOND is not at the stage where it can be classified as a scientific theory, so you can't rule it out yet," he explained. He equates MOND to the Bohr model of the atom which was used to describe the structure of the atom, but was not regarded as a true theory because it did address quantum mechanics. In addition, Starkman adds, "It was only three years ago since someone finally wrote down a fundamental theory for MOND that reconciled it with general relativity. It's still a work in progress." Starkman has his own ideas as to what might be causing the anomalies, which he first proposed earlier this year. Along with two Oxford colleagues, he has argued that dark matter can be explained by aether, which would be a field in space-time instead of a substance. Aether, says Starkman, would boost gravitational pull from matter in the universe and make it seem heavier. "If you imagine space-time as a rubber sheet which is being warped by a heavy bowling ball at the center of it," he explains, "Aether would be the softener which makes the sheet more bendable and cause things to have a greater gravitational effect than what you'd expect." Starkman's work on the aether also comes with a historical twist. In 1877, a physicist named Albert Michelson from the then-named Case School of Applied Sciences teamed up with chemist Edward Morley and disproved the concept of "luminiferous aether" which was thought to permeate space and aid the propagation of light. The Michelson-Morley experiment paved the way for Einstein's special theory of relativity, and was important enough to award Michelson the first American Nobel Prize in Physics in 1905. The fact that an old concept is resurfacing in the same department that disproved it over a century ago is ironic. Starkman, though, is quick to point out how they're not quite the same: "Unlike the luminiferous aether, this new aether does not directly affect the propagation of light except in the presence of matter," he says. Of course, if theories like aether or MOND end up being the true explanation for the dark matter problem, it means Akerib and the CDMS group have spent countless years of effort on a project that is looking in the wrong direction. Such worries are not new to experimental groups: there is always the chance that dark matter particles interact at much lower levels than currently estimated, or worse, may not interact in any measurable way with normal matter. When asked about the risks, however, Akerib shrugs them off. "There is both hunting and farming in physics," he explains. "I worked at an accelerator years ago, making little advances in particle states, and while there's nothing wrong with that work it's just not for me. By looking for dark matter, I have the chance of doing something really groundbreaking."